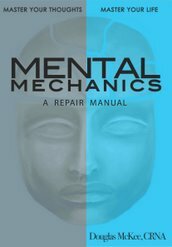 Mental Mechanics: A Repair Manual is a book about thinking. It is a very important work, and would be so even if I weren't the author. It is important because the human thought process is the most misunderstood and poorly controlled part of our life, and it creates almost all the negative emotions we have. Negative emotions cause probably 99 percent of all the suffering on the planet. Fear alone destroys more lives each year than all diseases and wars combined. Control through fear is the driving force behind all governments and all but a few religions. Mankind has gone just about as far as possible using systems built on fear, guilt, and dependency. We need to change our ways, but change is one thing humans don't really do well. Why do we put so much energy into resisting it when change is the true order of all things? What part, if any, does learning play in our lives if that is true? Obviously, the vast majority of humans reach a point in their lives where they believe they know "enough," whatever that means, and almost everything "new" presented to them after that doesn't get assimilated. Thankfully, there has always been a small percentage of humans who are wired a bit differently. With those who are so blessed or cursed, depending on their particular circumstances, everything gets questioned. Almost nothing is accepted without rigorous dissection and analysis. I'll bet I drove my parents and teachers crazy asking "Why?" and "How do you know?" No wonder I was offered the "marvelous opportunity" to go to a boarding school when I reached high school age. Eventually, I ended up in nursing school on my way to becoming a nurse anesthetist. When I administered anesthesia for the very first time, way back in 1972, I discovered what real terror felt like. All the disastrous possibilities that could befall my patients filled my mind, and I was sure one of them was going to happen in the next few seconds. After a hundred or so anesthetics, my "pucker factor" began to lower a bit and I realized my patients were more frightened of me than I was of what could possibly go wrong. Giving up mental control is among the most frightening things people can imagine, and that is what anesthesia represents to most of them. This was a turning point in my practice and from that moment on, learning how to comfort and support frightened patients became almost as important as administering the anesthetic itself. I tried numerous approaches to help calm my patients because fear presents itself in many different ways. I also learned how to carry on seemingly normal conversations with badly injured, hemorrhaging patients while getting a jillion things ready before putting them to sleep. Holding a patient's hand and gently reassuring them while they drift off to sleep helps a lot. A surgeon once said I had the best techniques for "peeling patients off the ceiling" that he had ever seen. I became curious about fear itself because it was the only "thing" almost all my patients had in common. My curiosity was not only about why patients are afraid, but what fear actually is, why it is so powerful, and what, if anything, can be done to alleviate it. The biochemistry of fear is fairly well known but medicine has done next to nothing about helping frightened patients. Studies at Harvard show that over 60 percent of all visits for healthcare are due to symptoms directly caused, or made worse, by stress. Stress is the result of our negative emotions, which are all ultimately expressions of fear. Everything I read from a scientific viewpoint led me to the conclusion that 99 percent of all fear is simply the result of faulty thinking. Danger is a real threat and we feel fear when danger is present. We feel it because we are mammals and we were born with the "fight or flight" mechanism built in. However, we are the only species that worries constantly when there is nothing to fight and no reason to flee. Worrying about all the things that could possibly go wrong with our lives is what causes almost all our fears. The challenge for us is to change our thinking processes so we don't worry all the time. Mental Mechanics is a clear and concise explanation of how we think. It explains how we accumulate information and how we use that information in the various aspects of our lives. The Table of Contents page shows what areas are covered. The processes we use in these areas are not difficult to understand and once mastered, our lives become better.